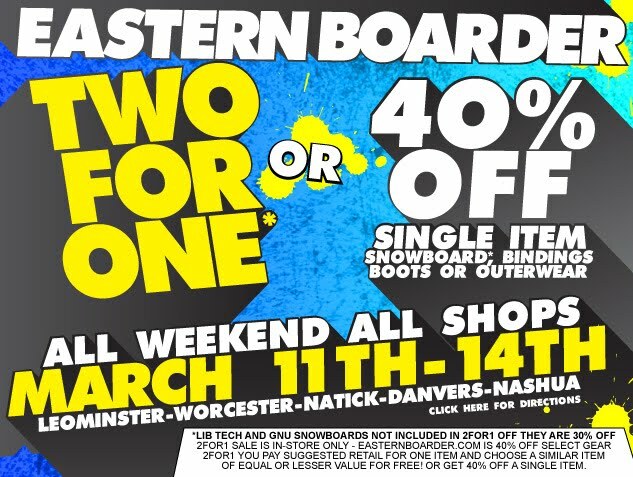 The Blog / EasternBoarder : TWO FOR ONE SALE!!! This is the best deal going. One weekend only. Snowboards, boots, bindings, Jackets, Pants and more are 241, so bring the family down hook up the kids, split it with a friend, because there is tons of riding left this year. Here's how it works, buy one item at regular price and get one other item up to that price free or buy a single item for 40% off! The his and hers- Buy a Burton Custom V Rocker for $559.99 and get your girlfriend a Burton Feelgood V Rocker for FREE (reg. $559.99) or buy just a V Rocker for yourself for $335.99 and sleep on the couch. The B&B- Buy Burton Hail boots for $249.99 and get a pair of Cartel bindings FREE (reg. $229.99) or buy just hails for $149.99 or buy just Cartels for $137.99. The Top to Bottom- Buy a DC Amo jacket for $149.99 and get Some 4 Square Wong pants for FREE (reg. $139.99) or buy just the jacket for $89.99 or just the pants for $84.99. The Sale includes all snowboards (with the exception of of Lib Tech* and Gnu* boards), all boots and bindings and all outerwear. *Lib Tech and Gnu boards are all 30% OFF and we just got restocked with skatebananas, park pickles, skunk apes and T-Rice boards.